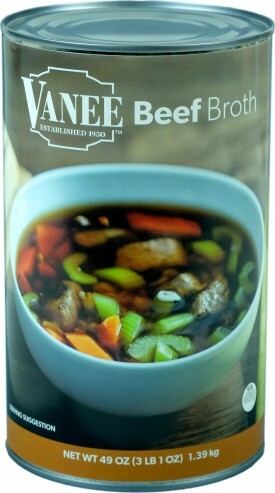 Vanee Beef Broth is a rich, full-flavored dark brown clear broth made from hours of slowly cooked beef. Use as an ingredient for soups, casseroles, pasta, or potatoes. Add in place of water to infuse recipes with more flavor. Vanee Beef Broth has less sodium than the national brands, is gluten free, and has no added MSG. Shelf stable, ready-to-use simplicity means you get consistent results every time. Ingredient for soups, casseroles, pasta, or potatoes. Add in place of water to infuse recipes with more flavor. Beef Stock, Contains less than 2% of Beef Extract, Beef Fat (with Citric Acid), Caramel Color, Dextrose, Disodium Inosinate, Disodium Guanylate, Flavoring, Grill Flavor (Contains Sunflower Oil), Hydrolyzed Corn Protein, Maltodextrin, Salt, Sugar, Yeast Extract.